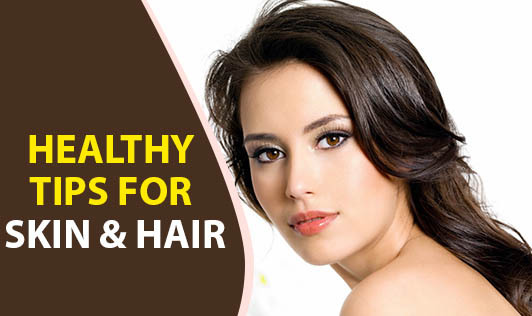 Here are some tips you could use to keep your skin and hair healthy. Eating nuts, lentils, fish, curd, citrus fruits, dark green leafy vegetables, can boost your skin and hair health. Reduction in alcohol & coffee consumption is beneficial to skin and hair. Myth: Acne is caused by dirt. Fact: The main culprit is a combination of oil and bacteria that reside inside your follicles and oil glands. Acne occurs due to oil, dead skin cells and bacteria clogging your pores. Fact : Brushing your hair stimulates hair follicles to produce more oil. It does cause friction against the hair and scalp, so it is important to do it gently and to use a brush of good quality. Just yanking away at the hair causes hair breakage and split ends, rather than actual hair loss. Fact: Although people with fairer complexions are at higher risk, people with medium to darker complexions can still get skin cancer. It's important to protect yourself from UV exposure, no matter what your skin tone is. Fact: Shorter hair often looks and feels thicker but cutting your hair won't alter its normal biologically determined growth rate or overall texture. Thin, limp or fine hair will never grow thicker in response to a haircut. Skin is about 70% water, 25% protein and 2% lipids.